A gunfighter struggles to put his violent past behind him when he finds his hometown under the control of a ruthless landgrabber. The father/son casting may seem a gimmick, but it adds an extra layer of discomfort to the tension between the two characters, and a late emotional breakdown by John Henry in his father's arms will have the toughest of male viewers reaching for the Kleenex. The western genre has given us family affairs in the past. Patrick Wayne appeared with his father John in Rio Grande, The Searchers, The Alamo, The Comancheros, McLintock! and Big Jake. Walter Hill's The Long Riders famously gave us four sets of real-life brothers - James and Stacy Keach; David, Robert and Keith Carradine; Dennis and Randy Quaid; and Christopher and Nicholas Guest. Forsaken pairs up Donald Sutherland with son Kiefer, and while they have shared screen credits twice before (1983's Max Dugan Returns and '96's A Time to Kill), this offers the Sutherlands their first chance to act opposite each other. 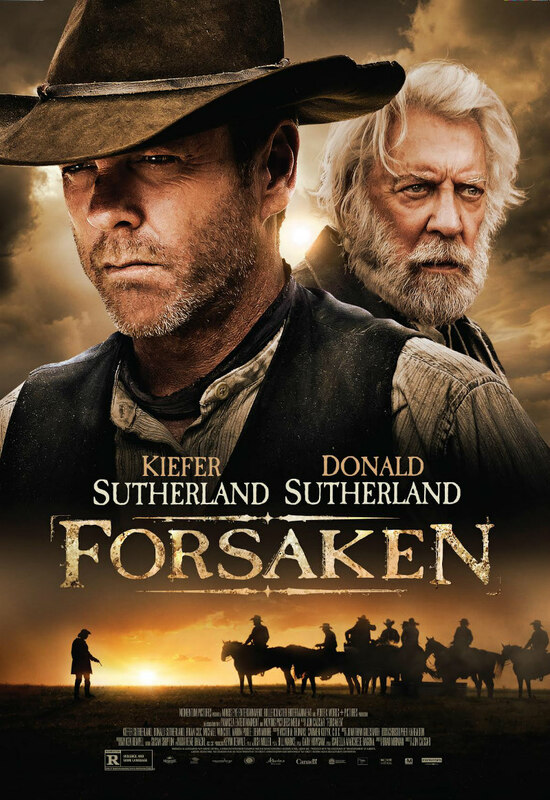 Kiefer is John Henry, a former gunfighter who returns to the home of his father, Donald's Reverend Clayton, hoping to leave his violent past behind him. Tensions immediately rise between the two men, with the Reverend upset at his son having deserted his mother in the years before her death, and unconvinced by John Henry's vow to turn a new leaf. John Henry finds one thing hasn't changed about his hometown in his absence; his former sweetheart, Mary-Alice (Demi Moore), still holds a candle for him, despite having married another man. But peace has left the town, thanks to the ruthless actions of James McCurdy (a steak and scenery chewing Brian Cox), who employs a gang of thugs to use violence against any land-owners who refuse to sell him their property, now especially valuable with the railroad set to slither into the town like a snake in the garden of Eden. 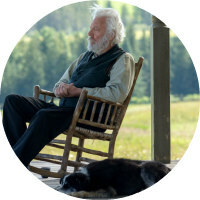 John Henry's reputation makes him a target for the thugs in McCurdy's employ, and it becomes increasingly apparent his new life as a pacifist may be short-lived. 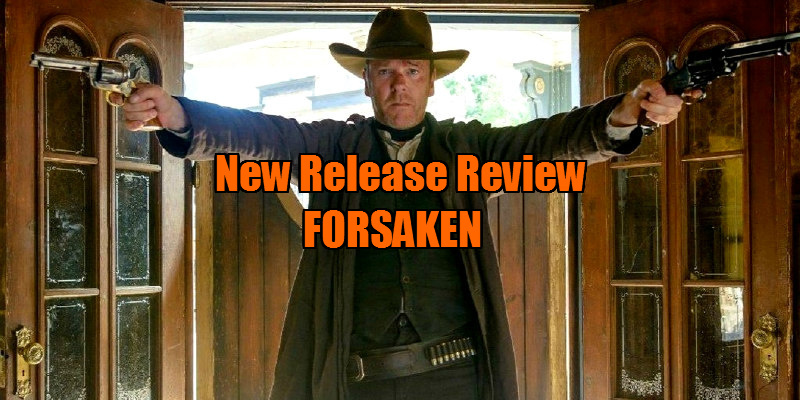 On the basis of its by the numbers premise, Forsaken appears to offer nothing new, but you could say the same about most westerns. Of all the filmic genres, the western is arguably the one where character and themes take precedence over story and plot in the most explicit fashion. This is why it's so attractive to filmmakers. Pit two men against each other in a dusty town and the rest is up to you; the opportunities to have those men represent political, social or moral ideas are infinite. The western is like a cheeseburger; you think you know what a cheeseburger tastes like, but every establishment puts their own spin on a simple culinary creation. The secret sauce here is Gentleman Dave Turner (Michael Wincott), a gunfighter hired by McCurdy to oversee his not so professional crew. Played with a melancholy charisma by b-movie veteran Wincott, Turner takes no relish in the violent tactics favoured by the other men in McCurdy's employ, but he knows he has a reputation to maintain. This leads to a fascinating relationship between Turner and John Henry; both men respect the other while despising the circumstances that appear to be leading them towards an inevitable confrontation. John Henry may be forced to kill Turner in order to finally throw away his gunbelt. Turner may have to execute John Henry simply to sustain his professional credibility. Wincott's moustachioed, grizzled visage lends a very human face to the industrialised violence that has played a part at many turns in America's industrial progress. Sutherland Junior makes for a highly effective western antihero. Kiefer has the rugged vulnerability of a Randolph Scott, or the Jimmy Stewart of those great Anthony Mann westerns. Forsaken's director, Jon Cassar, has previously collaborated with Sutherland on 65 episodes of TV's 24 - making the duo a sort of trashy TV John Ford and John Wayne - and we get the sense the actor feels in safe hands here. The father/son casting may seem a gimmick, but it adds an extra layer of discomfort to the tension between the two characters, and a late emotional breakdown by John Henry in his father's arms will have the toughest of male viewers reaching for the Kleenex.